WIU alumnus Michael Krebs, of Evergreen Park, IL, has been portraying Abraham Lincoln for much of his acting career. He performs with Debra Ann Miller, who has played Mary Todd Lincoln beside him for many years. WIU alumnus Michael Krebs, of Evergreen Park, IL, was part of this year's Heritage Days parade. 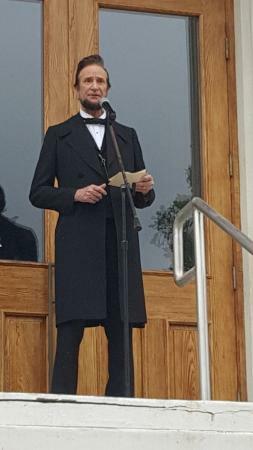 Prior to the start of the event, he delivered one of Lincoln's re-election speeches from the steps of the McDonough County Courthouse. MACOMB, IL – When Western Illinois University alumnus Michael Krebs, of Chicago, IL, walked in Macomb's recent Heritage Days parade, his memories extended beyond his time on campus into a realm he has portrayed as an actor for the last 25 years. Krebs has spent much of his acting career portraying former President Abraham Lincoln on the stage and screen as part of his company, With Lincoln Productions. Through his work, he memorializes many of Lincoln's famous speeches, including the Lincoln-Douglas Debates and his two inaugural addresses, as well as replicating the last day of Lincoln's life. Krebs is a 1978 WIU graduate who has spent his career as an actor in the Rockford and Chicago areas. He called his return trip to his alma mater for Heritage Days 2018 "a historical trip down memory lane." After graduating from WIU, Krebs spent some time acting in regional theaters and working for the New American Theater in Rockford, acting and teaching. It was during this time Krebs said friends advised him to find a niche for his acting, such as a one-man show. "That's when I first started thinking about Abraham Lincoln," he said. "Luckily, I had the WIU connection with a good playwright, (1977 alumnus) James Clark." Clark helped Krebs write a one-man show about Lincoln. It was through this connection Krebs said he also found Debra Ann Miller, who has played Mary Todd Lincoln beside him for many years. "She has been my partner over all of these years," he said. "She has traveled the country with me, from Washington State to Florida." Krebs first played the famous politician in 1994, reenacting the Lincoln-Douglas Debates in Galesburg, IL, presented live on C-Span. Since that first television appearance, Krebs has performed around the country, including at the Library of Congress and at a speech delivered by former President Bill Clinton. 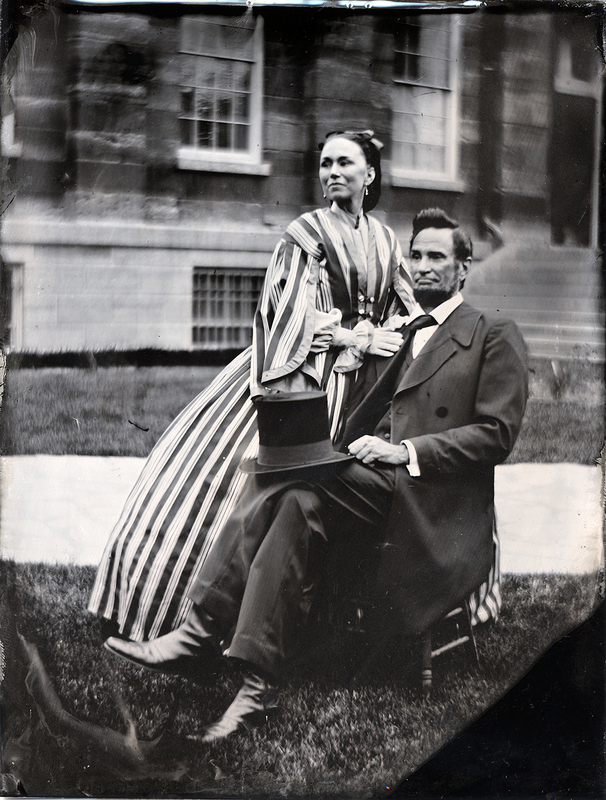 Krebs has also portrayed Lincoln in a variety of educational and historical venues and many times for events in Chicago and Springfield, IL, including at the Abraham Lincoln Presidential Library and Museum and the Lincoln Presidential Half Marathon. He has also performed in numerous commercials and television shows, including a commercial in Toronto, Canada, inviting people to visit Illinois. Standing six-foot, four-inches tall, Krebs' height matches that of Lincoln. "I wish I had his nose," said Krebs. "Lincoln had those penetrating light gray eyes, and his hands and feet were bigger than mine." During his Heritage Days visit to Macomb, Krebs delivered one of Lincoln's re-election speeches from the steps of the McDonough County Courthouse. "Some of the things from the speech relate to today," he said. "There were about 80 people gathered, and I spoke from the very steps Lincoln spoke from." For more information about Krebs' company, visit abrahamlincolnperformance.com.